When I make a recipe, I try hard to limit the amount of pots and pans I use. I am not a fan of doing dishes and any recipe that uses more than two, I’m usually out (unless I really want the meal!) 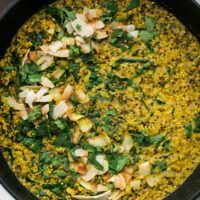 This is why I love risotto and risotto-like meals so much and this turmeric quinoa is the perfect example. It’s in one pan, the recipe is ready in about 25 minutes with minimal prep, and it is packed full of goodness. This recipe is inspired by the quinoa risotto I posted from the cookbook, The First Mess. It’s about as far as you can get from traditional risotto but with help from the coconut milk, it’s creamy and filling. I’m also a bit in love with the turmeric/ginger/coconut flavor combination. It’s the perfect fit for a hearty dinner, especially when greens are involved! 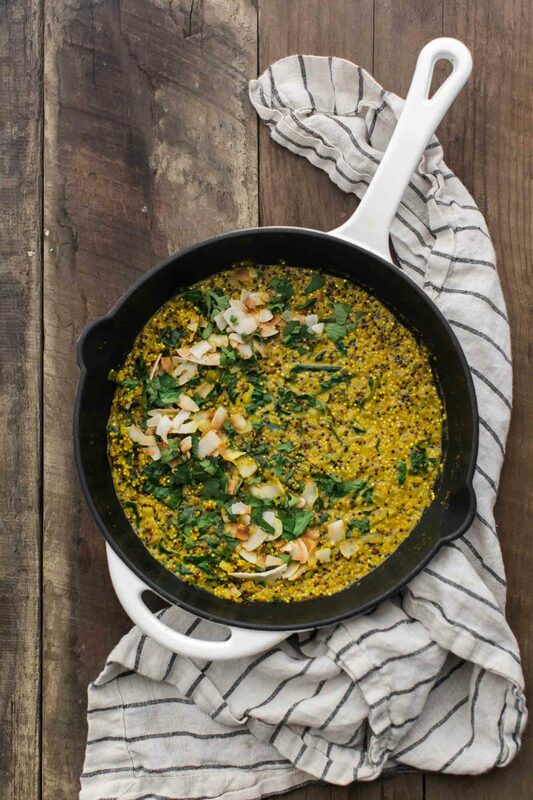 A creamy quinoa recipe that mimics a quinoa risotto but with turmeric, ginger, and coconut. Heat a medium pan over medium-low heat. Add the coconut oil followed by the minced shallot. Cook until the shallot is fragrant and translucent; 5 to 6 minutes. Stir in the ginger and cook for another minute or two. Add in the turmeric and salt. Next, stir in the quinoa followed by the vegetable broth or water. Bring to a boil, reduce to a simmer, and let cook until most of the liquid has been absorbed; 12 to 15 minutes. Add the coconut milk followed by the shredded kale. Cook until the quinoa is creamy and the kale as wilted to your liking. 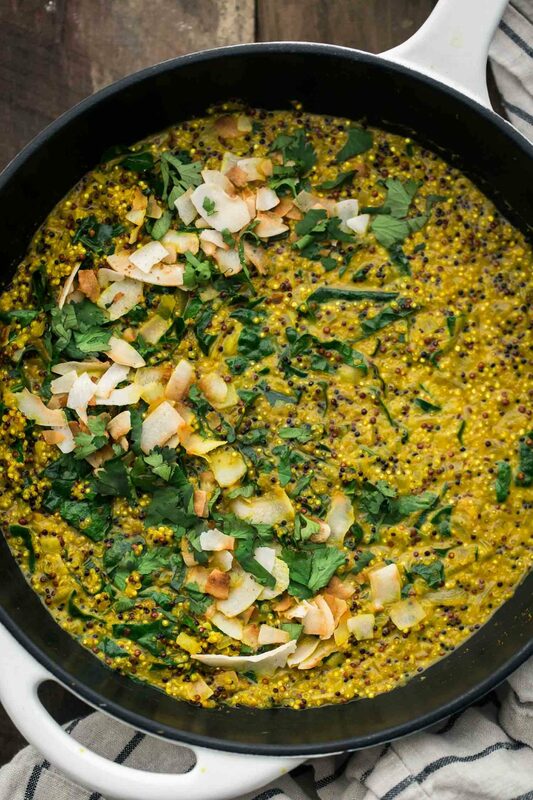 Divide the quinoa into two bowls and top with toasted coconut flakes and cilantro before serving. Tips + Tricks: I use the full-fat coconut milk from a can. I like to transfer it to a sealable container and shake well before using since most of the canned coconut milk is separate. 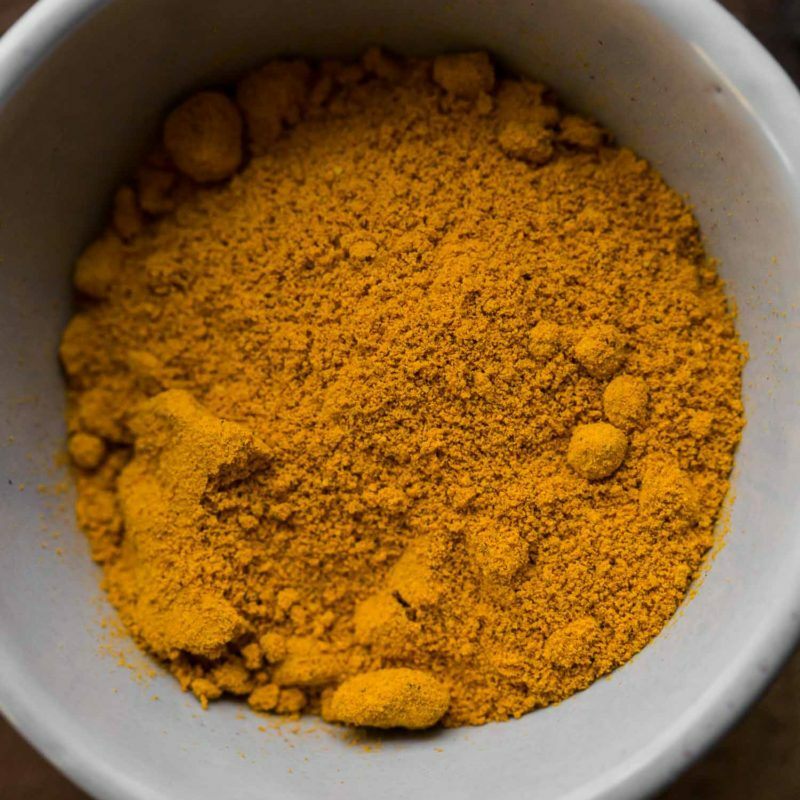 This turmeric quinoa is one of those recipes that if you keep the general idea, you can really change up the ingredients. I primarily love this recipe because it’s a solid and quick pantry meal. Greens: Any type of green would work in this dish. Spinach, beet greens, turnip greens, or chard- use whatever you have on hand! You could also make these garlicky greens and serve on the side or on top! Vegetables: During the summer, I love adding roasted zucchini or summer squash into the mix. In winter, roasted butternut squash or kabocha squash and in spring, asparagus! Grains: I love quinoa for the quick cooking but cracked spelt or farro work well in this dish- the liquid and cooking time both need to be increased! Major Noms!! This looks soooo good! This looks wonderful. Looking forward to trying it out, thanks for sharing! This looks so flavorful! I love the idea of adding zucchini.. i cant get enough of it right now! I combined this recipe with your Beet Wild Rice Salad recipe and took the finished product to a potluck picnic. It was a hit. Instead of quinoa, I used the wild rice and some regular brown basmati rice (the brown basmati helped sop up the coconut milk). I added cooked Chioggia and golden beets with the toasted pistachios at the end. Otherwise (haha), I followed your recipe above. It was lovely! I just made this and it’s so delicious!! I had to substitute with vidalia onion and mixed greens but it is still so yummy! Thank you so much. I love the tweaks that your followers have made. ? I added tofu, chopped dried apricots, cayenne pepper, cashews at the end for crunch and spinach instead of kale. Definitely a repeater, as I watch my husband finish his third helping…? Am I the only person that cannot see the recipe? There is not a recipe listed anywhere…. it looks like something was cut off in the middle before the youtube video so now there is no recipe. Even when you hit the “print” button it just shows a little bit of the word “Natur” cut off. how can i get the measurements and ingredients, and directions in list form?? Hi Sydney- should be fixed now. I had a pretty major update to the site this morning that just had a few glitches in a couple of recipes! No offense, but this recipe lacked some major flavor. It’s like Karen from accounting made this and was blown away. It tasted rather bland. So I added some lime juice, Spanish peanuts, dried cranberries, and some lean chicken sausage. I think it could benefit from some garlic as well. It wasn’t bad in its original form…just rather bland. I made this recipe tonight for dinner, with some variations. I kept the main ingredients : quinoa, turmeric, coconut, kale but added some green peas and tofu for a more complete meal…also added garlic and curry powder to taste. It was really good! I love how all your recipes always inspires me. Thank you!